ABS - AIR BAG - SRS - CHECK ENGINE LIGHTS ON? 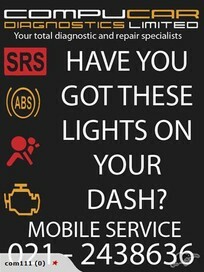 MOBILE SERVICE We will come to you and Diagnose your faults. ABS , SRS, Air Bag, Check Engine lights,Declaratio­n of SRS / ABS and / or ESC systems. CHECK ENGINE - SRS - ABS - AirBag - Service Resets - Control Module Recodes and Re-program­ming Declarat­ion for SRS and ABS systems. At Compucar Diagnostics Ltd we provide diagnostic trouble shooting for the public and to the motor trade. We provide this service on site, at your home, place of work or at garages, compliance centers and crash repair centers. We perform this service using the latest diagnostic tools. We perform diagnostic checks and fault finding on all vehicles with fuel injection systems, ABS systems, SRS Airbag Systems etc. If your car has the check light showing on the dash, either flashing or constant, this is an indication of a fault with a management system, there may be a component or wiring fault or just a simple reset. Declaratio­n of SRS / ABS and / or ESC systems for Repair Certificat­ion / Compliance­. When the ABS computer detects a fault it will turn on the ABS warning light. When this light is on, the ABS is switched off and this will increase your stopping distance making it harder to avoid possible dangerous situations. With the ABS light on you will also fail a Warrant Of fitness. If there is a fault with the SRS system on you vehicle you will see the SRS fault light on the dashboard stay on. When the light is on and a fault exists the SRS will not operate in the event of an accident, this can increase the chances of serious injury or even Death. With the SRS light on your vehicle will also fail a Warrant Of fitness. PLEASE NOTE: AT NO TIMES SHOULD YOU TRY TO REPAIR THESE SYSTEMS YOURSELF AS SERIOUS INJURY CAN OCCUR IF THE ITEMS OF THIS SYSTEM ARE NOT HANDLED AND TESTED CORRECTLY! Chris does a great job, very professional. Arrives on time, and knows his stuff. If you are having Airbag issues, I would highly recommend you give him a call. SRS light on my Mistral was on for some reason, Chris sorted with a reset. didn't take long and all good. Definitely should be first choice for diagnosis of faults. I recently got my airbag flashing light sorted from this business. From the start to finish, it was a very professional and easy dealing. I fully recommend these guys. You absolutely can trust these guys to get the job done. Think I need this, as the SRS indicator in my 1996 Honda US Wagon stays lit. hanks guys. Frank WLG.